Short video about SLI programs. 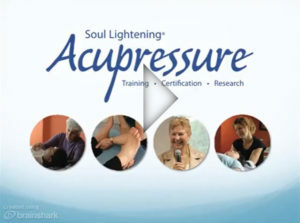 Thank you for your interest in our Soul Lightening® Acupressure training and certification programs. Our students and practitioners are health professionals, like you, who are refining their skills to consciously and compassionately address the needs of their clients. We are here to provide you with a time-tested method to support your clients as they reclaim their own health. The ancient art of acupressure can be a life-long study, but our trainings provide a simple, effective, and safe pathway to whole-being health that you can begin using in your practice right away, as well as ongoing support as you deepen your practice over time.